Polish-Jazz: Rafał Mazur & Keir Neuringer on European tour!!! 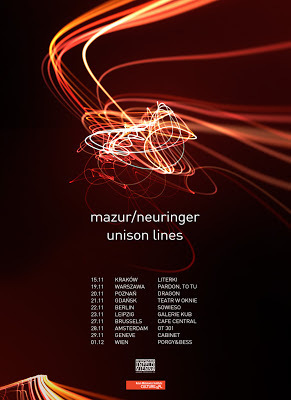 Mazur and Neuringer met in October 1999 at a drummerless jam session in one of Kraków's cellar jazz clubs and have been performing together in various formations ever since. They formed the free-jazz trio Stability Group in 2000, Infinity Quartet (with Ryan Zawel on trombone and Marek Choloniewski on electronics) in 2001, and co-founded an improvisation collective [i.e] that has connected many musicians internationally. Yet it is their duo that has been a primary force in their individual musical developments since 1999. Mazur and Neuringer share an intuitive sense of form developed in real time and in tandem with each other, and produce an extraordinary range of sonorities in light of the limited physical sound sources they use (acoustic bass guitar, occassionally bowed, and unamplified saxophone). In their years of playing together they have moved between and within extremes of energy and restraint, opening up for audiences what is essentially a longrunning dialogue between two close friends expressed in musical terms.